ALMOST half of all mothers in two-parent families are back at work before their youngest child turns one, completing a social revolution that has seen the dividing line between home and career disappear in less than a generation. The proportion of stay-at-home mothers with a child aged less than one year old dropped from 57 per cent in 2006 to just 52 per cent at the 2011 census. By contrast, the figure for single mothers edged down from 74.9 per cent to 73 per cent. Almost all the mothers who went back to work in this period took part-time jobs with fewer than 25 working hours a week. On present trends, a majority of mothers in couple relationships with a child under one will be in the labour force – either in work or looking for it – by next year. A clear majority is likely to be in work by the time of the next census in 2016. The exclusive official data, commissioned by The Australian, confirms why childcare is a hot button issue in the community as an increasing number of families compete for places for their babies, who require a greater level of one-to-one attention. Mother of two Jacqui Clark took only seven months maternity leave when her first child, Olivia, was born last year. The 42-year-old gave birth to her second child, Angus, in June and plans to return to work by next February, four months before her son’s first birthday. Ms Clark said that in the mid-1970s her mother waited until both her children had started school before she returned to the workforce. “There are a number of reasons I chose to go back so quickly, but the first one is probably the mortgage and cost-of-living pressures,” Ms Clark said. Ms Clark said she and husband Bruce, a helicopter pilot – “middle-income earners” – met in their late 30s and it felt like they had been playing catch up since. “We bought a house three years ago and we want to be able to renovate and do the things to be comfortable, but to do that we both need to be working,” she said. Ms Clark has a background in nursing and works full time for a biotech company, but said she would prefer to work part time and be able to spend more time with her children. Olivia attends day care facility four times a week and once Ms Clark goes back to work Angus will be next in line. Otherwise, Ms Clark leaves the children with her mother or her husband, who works non-traditional hours. The Clarks receive the childcare rebate, but Ms Clark said her family would benefit from government subsidies for in-home carers. The bottom lines are: this generation of women have jobs worth going back to and the typical mortgage requires two incomes to service. The threshold between home and career has changed with each decade of deregulation. 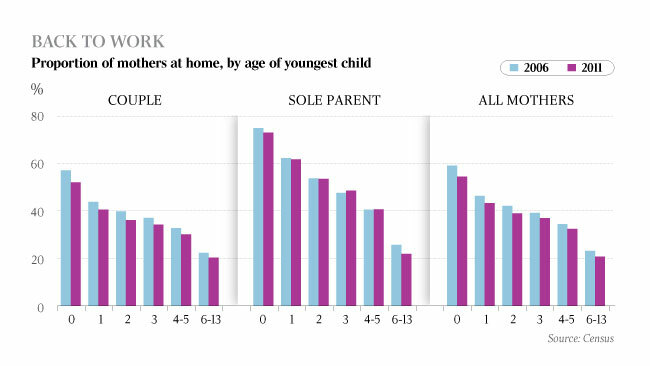 At the 2006 census, the majority of mothers were back at work with a youngest child aged one. This social revolution has left both sides of politics playing catch-up. The Howard government was forced to switch its handout priorities from stay-at-home to working mothers in the last decade while the Gillard government’s budget is stretched across childcare, pre-school and schools in this decade. A remarkable feature of this shift is the global financial crisis in 2008-09 did not interrupt, let alone reverse, it. The original tables were supplied along with yesterday’s second release of material from the 2011 census. The breakdown of work and family data shows about two-thirds of mothers with jobs are employed part-time while their children are in preschool.